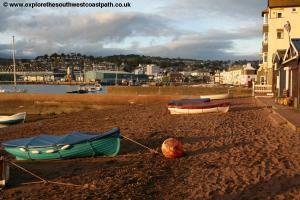 This walk starts in the popular resort of Teignmouth. Crossing the river Teign to Shaldon, there is a very steep climb to the cliff top, and many hills after that, although there are stunning views around the coast from the cliff top. 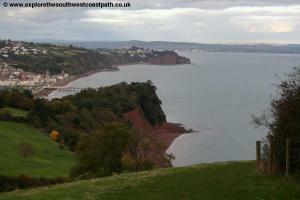 The path flattens out a little towards to Babbacombe. 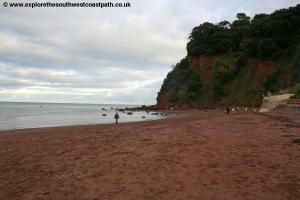 There are good beaches at Teignmouth, Ness Cove (Shaldon), Maidencombe and Oddicombe. 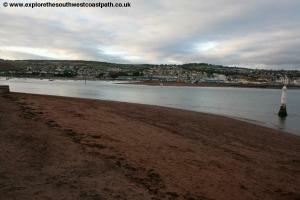 Teignmouth is easily reached by road. From the A38, the main trunk road between Exeter and Plymouth join the A380, a dual carriageway to Torbay. At the junction with the A381 head east along the A381. At the junction with the A379 at Teignmouth Bridge, continue straight ahead and then turn right for the town centre and beach. There is a large pay and display car park just to the south of the pier. If you are coming by public transport, Teignmouth has a railway station with between one and two trains per hour, typically from Exeter or Exmouth (via Exeter) to the east and Paignton to the south. There are also some longer distance trains to London, the Midlands and to Plymouth and Penzance. Most trains to Teignmouth are operated by Great Western Railway but Cross Country Trains also operate a few longer distance services. In addition Stagecoach South West bus route 2 runs 3 times an hour Monday – Saturday and hourly on Sunday between Newton Abbot and Exeter via Teignmouth. 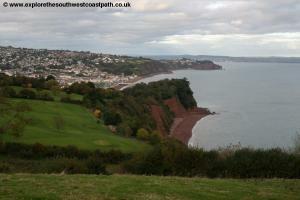 There is a good choice of accommodation in Teignmouth and Babbacombe. 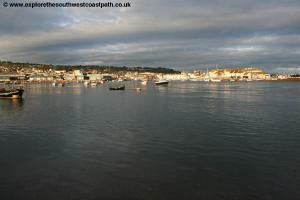 There is a tourist information centre in Teignmouth and Torquay, which can help with accommodation. See below for some useful links. 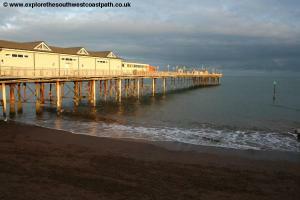 This walk begins from Teignmouth Pier. The pier was sadly badly damaged in storms in February 2014 and has only fairly recently re-opened. Continue along the promenade until you get to a large car park. 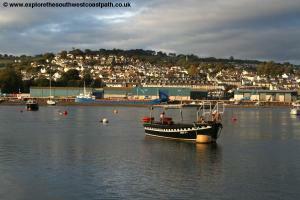 It is necessary to cross the river Teign and the recommended route (and official route) is to use the The Teignmouth Shaldon Ferry. This runs operates every day except for Christmas Day and New Years day. The service hours vary and are on the website, but it is always operating between 10am and 4:30pm, with the service starting from 8am on most days and running to 6pm (or dusk in peak summer). It runs on demand or every 10 to 15 minutes at busy periods. Assuming you are using the ferry, as you approach the life boat station go to the left of this and to the far side of the car park to reach the back beach, from where the ferry will take you over the River Teign, to Shaldon. If for any reason the ferry is not running or you decided not to use it you can also cross via the bridge, but this will add around 1 mile to the walk. 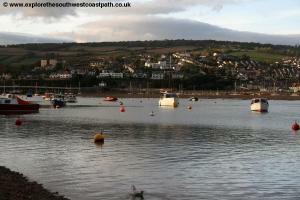 The Teign estuary is very beautiful with the red cliffs of the Ness a particular landmark. Once over the river, turn left on the beach with the sea on your left. You pass a shelter on the right that has a radar on the top (by the look of it) and continue to the little promenade. Here turn right and follow the path right along the top of the cliffs, through trees. This climbs up onto the Ness, and rounds the cliffs to turn to the right, heading south. You now climb up a steep path between hedges, with the coast to your left and a golf course to the right. Below you is Ness Cove beach. This can be accessed from a tunnel from the car park just off to your right, which is an original smugglers tunnel that has been modernised. 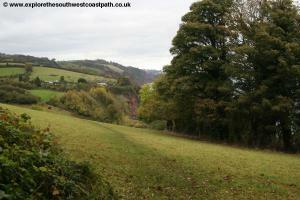 The path goes steeply up beside the golf course and as you get past the golf course opens up to give good views of Teignmouth below and the coast ahead, as well as the rolling countryside inland. As you reach the top, the path runs parallel to the road and briefly emerges onto the road at a corner. However it is only a couple of metres along the road before you can turn off again on the path through woodland that goes around the edge of a field. The path now goes around the coastal edges of a couple of fields and then heads through an area of woodland. You are passing above Labrador Bay below, a sand and shingle beach but sadly inaccessible without a boat. You emerge from the woodland and continue on the cliff edge, with fine views to the north over Lyme Bay. The path along this stretch is never flat though, and you are continually going up and down, so allow plenty of time. You are now passing two fish-themed coves, Herring Cove and Mackrel Cove. There are a couple of paths heading inland to the main road here, but the main coast path continues as a good path around the edge of fields. Soon you reach the track that heads down into Maidencombe. 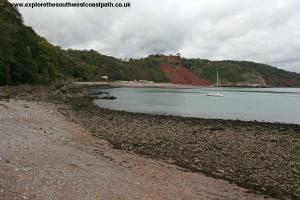 The path emerges into a car park for Maidencombe beach, where you turn left. If you wish to finish the walk at Maidencombe, head up the road rather than down here, to reach the A379 and the bus service back to Teignmouth. 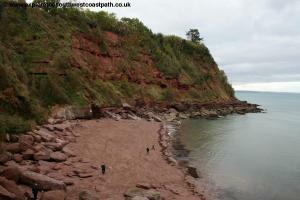 There is a dead-end path down to the beach at Maidencombe, which is a beach of red coarse sand, backed by the red cliffs for which the area is famous. The main coast path now follows the field edge paths around a few fields. This is a again a hilly path, but not as bad as some of the previous hills. You approach an area of woodland and the path goes straight ahead through the woodland near Bell Rock. You emerge briefly into a field and keep ahead before entering another stretch of woodland. This is the Valley of the Rocks and as you would expect is rather hilly. The path heads a little back from the coast through the woods and you soon reach the access road to Watcombe Beach ahead. This is a secluded little cove in the woodland and feels very remote, even though the suburbs of Torquay are only around Â¼ of a mile away. 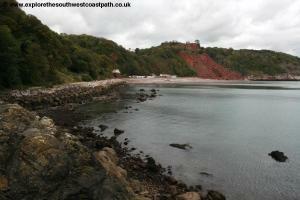 Like Maidencombe, Watcombe is a beach of coarse red sand backed by red cliffs and woodland. 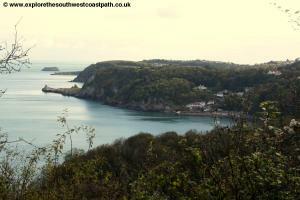 Cross the track leading to Watcombe Beach and continue on the coast path ahead, signed with wooden posts. The coast path now heads through the woodland back to the coast and runs at a fairly low level through the woodland for a short distance. This doesnâ€™t last long though, and soon you turn right and inland heading up a steep path to reach the top of the woodland. At the track ahead, turn left and follow this along the top of the rather unstable cliffs with a golf course on your right. Unfortunately these unstable cliffs have caused the old coast path to be lost. There is a path down to Petit Tor beach but it is a dead end now for the coast path. So just past the golf course and by the first set of houses turn inland as directed along Petitor Road. At the end of the road you reach the A379 once again. Turn left and after the last house on the left, take the footpath left down a pleasant grassy valley. This soon enters woodland above the cliffs and you pass the tracks of the cliff railway that leads from Oddicombe beach. Keep ahead and take the lower path that descends down to the beach. Oddicombe Beach is a good beach, another red coarse sand beach but with more facilities than most, with the cliff railway, a cafÃ© and even a little museum about the cliff railway, as well as some beach huts. The far end of the beach suffers with rock falls, as you can see, and these have claimed at least one of the houses on top of the cliffs here. As the signs say, you should keep away from the north edge of the beach, due to the risk from rock falls. 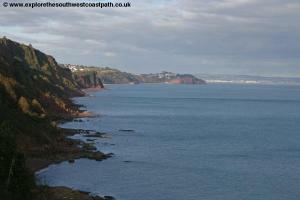 From Oddicombe Beach, a good low level path runs along the base of the cliffs to Babbacombe, with a wooden footbridge in one place to help you get over the rocks. 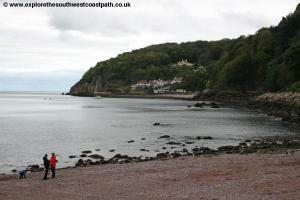 You pass a small waterfall on the right and then come to the beach at Babbacombe. This is a pretty secluded little beach, with a small village and pub at the far end, and marks the end of this walk. If you are returning by public transport, follow the very steep road up from the beach. You emerge by the Babbacombe Theatre. Turn left here along Babbacombe Downs Road to the A379 and turn right for the bus stops. 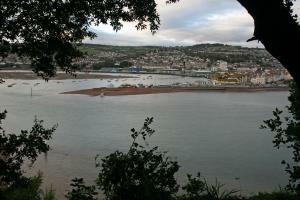 To get back to Teignmouth it is recommended to travel by bus. 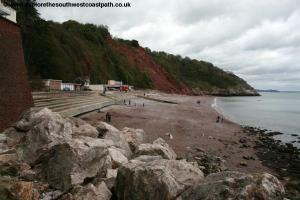 From the beach at Babbacombe head up the steep road, Beach Road until you reach the top and the Babbcombe Theatre. Turn left here along Babbacombe Downs Road to reach the main A379. Turn right and you should reach the bus stop, opposite the Dog and Duck. From here, Stagecoach South West bus service 11 runs hourly, seven days a week, back to Teignmouth, a journey of around 30 minutes, and runs until fairly late in the evening. 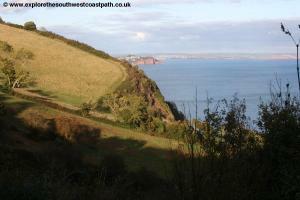 This also serves Maidencombe Cross and Shaldon if you have made a shorter walk. In addition, Stagecoach South West bus services 32 and 22 run around every 10 minutes Monday – Saturday and every 30 minutes on Sunday to the centre of Torquay. Ordnance Survey Explorer 110 (Torquay & Dawlish) covers the coast between Teignmouth and Babbacombe and is available in the tourist information centres in Teignmouth and Torquay, from bookshops locally and from online retailers. The following links also show the maps of this area.